I will show you an example of 802.1X with a RADIUS server. I am going to use Elektron RADIUS server as the authentication server because it’s easy to install and has a nice GUI. Username, password and a digital certificate on the server. Username, password, digital certificate on the server AND on the clients. I want to create a new user account. Click on authentication, Elektron accounts and then on the big green plus symbol in the menu. My new user account will be for Alice. My password will be “safe” and I don’t need her to be member of any groups. Click on OK.
By default Elektron will check Windows usernames instead of its own database. We need to configure it so the local database is used. Click on “Authentication Domains” and then on “Default Authentication Domain”. Change it to “Elektron Accounts” and click on OK. That’s all you have to do on the Elektron RADIUS server, we’ll look at the switch now! Which IOS version are you running? I would expect this device to support all 802.1x commands. First off if I post this in wrong place let me know and I will move the question to better forum area. I am studying AAA Authentication. I keep hearing it stressed to be aware that its best practice to put “local” on the end of your lines in case your tacacs server or radius server goes down. Good to hear you figured it out. The output of your Boson simulator was indeed that it was unable to connect so this didn’t have anything to do with your AAA configuration Boson is nice to practice commands but it’s only a simulator so you can’t really test things. 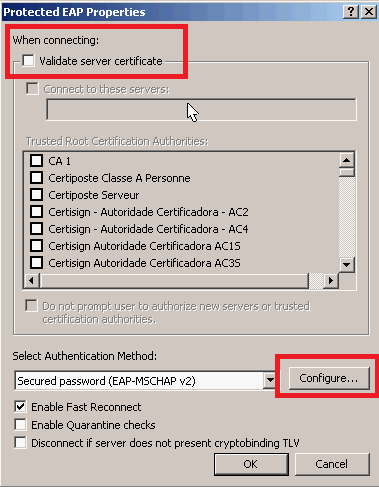 The RADIUS server generated a certificate and when the client connects, it checks the server certificate to see if it’s talking to the correct server. The client then sends a username/password to authenticate the client.